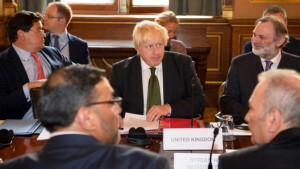 The Western media has now repeatedly reported on a so-called “transition plan” unveiled in London by what it calls the “High Negotiations Committee” (HNC) – a group Western media outlets refuse to identify, enumerate, or discuss behind their superficial headlines. The umbrella group representing Syria’s political and armed opposition factions has set out a plan for a political transition to end five years of war. This lack of information regarding who the HNC actually is comprised of is not due to the fact that Western media outlets do not know, but precisely because they do know – and including this information in articles about their “transition plan” would undermine its legitimacy. The majority of the committee do not even reside in Syria and have little to no ties with actual militant groups fighting on the ground there. Those armed groups that do continue to fight, are now openly operating under the umbrella of US State Department designated foreign terrorist organization Jabhat Al-Nusra – Al Qaeda in Syria – and have done so since a failed offensive attempting to break the Syrian government’s encirclement of Aleppo last month. In essence, this is a “transition plan” proposed by a fictional opposition committee that has no power in Syria, and should Syria and its allies be irresponsible enough to accept such a plan, they would be negotiating with irrelevant players hiding abroad while failing to address the very realities on the ground in Syria itself. It is a recipe for compounding the conflict, not ending it. The HNC is a creation and perpetuation of US and European interests, not that of the Syrian people, or even that of armed groups fighting in Syria. Syria and its allies are already engaged in negotiations with various groups inside of Syria on the ground, negotiating partial ceasefires, disarmament and withdrawals, and even, by the BBC’s own admission, the releases of prisoners captured by the government during the war. It is the fact that these negotiations will eventually end the war in favor of Syria and its allies and not Western interests that the West has attempted to expand and intensify the conflict as well as propose “transitions plans” through its fictional opposition committee in London. However, the Syrian government’s negotiations already ongoing reflect the reality on the battlefield of a Syrian government and people backed by its allies incapable of being toppled as was done in Libya and neighboring Iraq. The vast majority of the Syrian people currently live in government held territory with – even in 2013 – only 15-20% of the population remaining in areas held by militants. In the October 2013 issue of the French online journal OrientXXI, you published an essay on how the divided political space of Syria is being represented on maps: “L’insurrection syrienne et la guerre des cartes.” There, you provided rough estimates for the share of Syria’s territory and population held by each of the major politico-military camps. At the time, you had calculated that 50–60 percent of the population inside Syria—but somewhat less of the physical territory—remained under the control of Assad and his allies, while the various Sunni Arab insurgent groups controlled 15–20 of the population and the Kurds had perhaps 5–10 percent. The remainder consisted of people residing in contested areas. Since 2013, more cities and territory has been retaken by the Syrian government, including some of the largest, most populated cities in the country meaning that even fewer people today exist in areas held by militants supposedly represented by the HNC. The West’s insistence that Syria negotiate with and hand the nation over to fractured, violent armed groups clinging to corners of the country and who now operate openly under the banner of Al Qaeda, is a strategy formulated by those seeking Syria’s destruction, not its salvation. It is also a strategy that would render the nation as hopelessly divided and destroyed as Libya now lies today. The only pressure Syria and its allies now face to accept such an unfavorable deal lies not in the actions of “Syrian” groups on the ground, but in an ongoing invasion being conducted by NATO-member Turkey in northern Syria. However, with Turkish troops now in Syrian territory, the ability for Syria and its allies to wage a more open proxy war against Turkish troops as they drive deeper into Syrian territory may avail itself, bleeding Turkey’s forces in protracted combat and opening the door to Kurdish uprising within Turkish territory itself. Should Syria and its allies remain patient in the face of Turkey’s execution of a US-designed “safe haven,” the worst possible outcome is a forward staging zone from which militants can refit and rearm before launching further attacks into Syrian territory, particularly against Aleppo. There are logistical and military limits to how far and how long Turkey can operate inside Syria and limits to the fighting capacity of militants it will be providing cover for. While Turkey claims it is attempting to confront terrorists of the self-proclaimed “Islamic State” (ISIS), it is in fact rushing in to preserve their final logistical corridor. With Turkey claiming it has now sealed the border, should ISIS maintain its fighting capacity within Syria, this will suggest that ISIS supply lines have been preserved, even expanded by Turkish forces. It should be noted that Russian airpower had been striking logistical routes throughout Turkey’s so-called “safe haven” specifically to disrupt ISIS supply lines flowing out of Turkish territory. In reality, should Turkey have truly desired to collapse ISIS’ fighting capacity, it should have done so by disrupting its camps, command centers, and logistical hubs inside Turkish territory. That it has chosen instead to use ISIS as a pretext to launch a long-desired incursion into Syria aimed at toppling the Syrian government – not fighting “terrorism” – complicates and compounds the Syrian conflict and in no way is contributing toward its peaceful resolution. The balance now hangs in Syria and its allies’ ability to confound Turkish forces and disrupt logistical operations emanating from its so-called “safe haven.” As this “safe haven” expands, Turkish forces will be forced to spread out. The inability to concentrate forces while attempting to maintain such an expansive “safe haven” provide the prefect conditions within to wage unconventional warfare against Turkish forces and the militants they are harboring. While US policymakers and their Turkish executioners pose as having made a “power move” in Syria, they have prepared the grounds instead for a protracted quagmire – should Syria and its allies choose to transform it into one, and a quagmire that may in and of itself become a bargaining chip in the near future.